The Withings WS-50 Smart Body Analyzer is a wireless body analyzing device which not only measures statistics related with your body but also provides the status of the environment of your house. This monitor automatically syncs with iOS and Android devices to provide the exact levels of the user’s weight, body fat composition, heart rate along with environmental data. It’s quite easy to use as you just have to stand on it to get all of the information related to your body. By using this device, you can keep a check on your daily health and can easily analyze whether your weight control program is working for you or not. The Health Mate app provided in the package stores all your weight, fat composition, heart rate and environmental data by syncing it to your personalized dashboard on the Health Mate app. This feature allows the user to access the previous records so as to get the real feedback by accessing graphs, individual measurement tables and real time status of health by comparing with the previous reading. This feature can help you to break down your goals into achievable weekly targets, while keeping you focused with relevant tips and reminders. This wireless analyzer also helps in keeping your living environment suitable for a healthy life style by indoor air-monitoring. By assessing the exact amount of carbon dioxide levels through this device, you can opt for airing indoors by opening windows and letting the fresh air inside your home. This analyzer also helps each user to set weight goals and to get lessons on how to achieve these goals. As it’s compatible with over 160 partner health apps such as RunKeeper, myfitnesspal, Apple Health, LoseIT and many more, this analyzer provides all the coaching to realize your health goals via your smart phone device without the requirement of joining any gym or health spa. This analyzer also provides a localized daily weather report so that you can easily plan your schedule for that day! Free Withings Health Mate application for comprehensive and streamlined data management. Provides a weighing range of 9 lbs to 396 lbs. The daily weather report is not fully accurate. The Withings WS-50 Smart Body Analyzer provides the same features, such as weight and body composition, featured in its earlier model – the Withings Wi-Fi Body Scale. Apart from these features, this new version also provides added bonuses which include a heart rate monitor, air-quality tracker and a daily weather report. Its clean, tempered-glass design makes it compatible with any type of bedroom or bathroom décor. With a crisp and clear display on the scale and its web interface along and mobile app (for both Android and iOS devices), this smart body analyzer is a perfect choice for a health-conscious family. 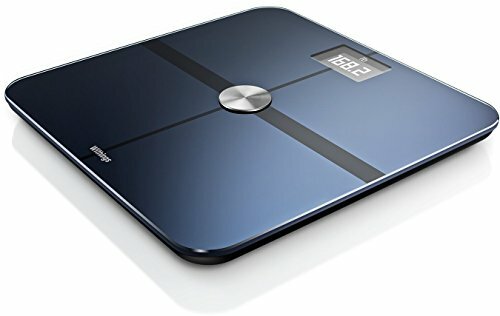 If you’re looking for a smart body analyzer, then you should compare the Withings WS-50 Smart Body Analyzer with the Fitbit Aria WiFi Smart Scale and the Easy@Home Bluetooth Body Fat Digital Scale as both of these products feature weight and body composition readings via smart phone devices. If you’re looking for a smart body analyzer then the Withings WS-50 Smart Body Analyzer is the best option as it provides a high standard of weight monitoring with its body position detector technology along with body fat composition, BMI and heart rate reading and environmental data. The user-friendly application provided with this monitor allows the user to get real feedback by accessing graphs, individual measurement tables and real-time health status, thus helping the user to break down his or her goals into achievable weekly targets, while helping to retain focus with relevant tips and reminders. The Fitbit Aria WiFi Smart Scale uses advanced technology to track weight, lean mass, body fat percentage and the BMI index of the user. This scale can be used by only eight users and it displays the data of an individual using home Wi-Fi network at a private Fitbit account. You can use any smart phone device or laptop to access this account by going to the Fitbit website and logging into your account. This smart body analyzer can be also paired with any of the Fitbit tracker devices. The Easy@Home Bluetooth Body Fat Digital Scale features advanced technology to provide important information regarding the user’s body. It helps to keep track of body fat, body water, muscle mass and bone mass to help the user to maintain or to improve his exercise and dietary regimen as needed. The hour-glass fitness-inspired design of the scale is manufactured using tampered glass for the platform and stainless steel for its accents. Considering the fact that you’re looking for a smart body analyzer then the Withings WS-50 Smart Body Analyzer is the best option as it provides such a high standard of weight monitoring with the help of its body position detector technology along with body fat composition, BMI and heart rate readings and environmental data. The second best option is the Fitbit Aria WiFi Smart Scale as it uses the advanced technology to track weight, lean mass, body fat percentage and BMI index of the user. This scale can be used by eight users and displays the data of each individual by using home Wi-Fi network at the private Fitbit account. If you’re just looking for a body analyzer to check body fat, body water, muscle mass and bone mass only then should you opt for the Easy@Home Bluetooth Body Fat Digital Scale.